Protests have had an impact on the ramming of the Dakota Access Pipeline across the Standing Rock Reservation. 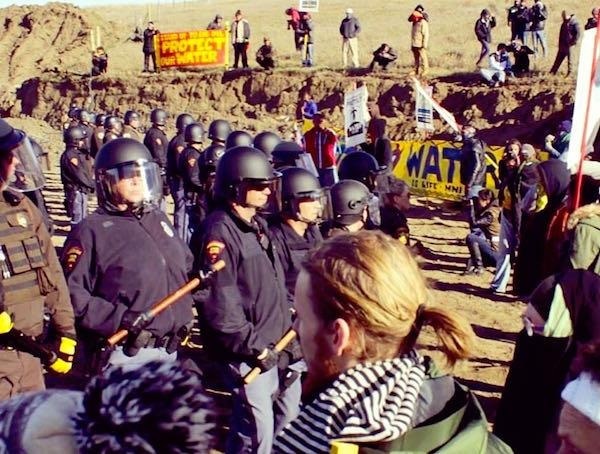 Despite over 3,000 protestors being present at any given time, slow progress and caravans of support from as far away as Texas, Energy Transfer Partners, Marathon Oil and the Morton County Sheriff's Department have escalated their tactics and mobilization. Military Aid is flowing from the State Attorney General's office, Sheriff's Departments around North and South Dakota and as far away as Wyoming. In addition to the tribble like multiplication of small town Sheriff's Deputies, the Hennepin County Sheriff's SWAT team has been sighted deploying from Minneapolis. The mainstream media blackout and denial is deafening. Despite a local Minneapolis alternative paper, the City Pages, managed to come through with solid evidence. This was disputed by the Time Warner/AOL owned Minneapolis Patch, which wrote a long rambling screed about the Minneapolis Police Department not being sent. They ended their coverage with an attack on City Council Member Alondra Cano and a terse but misleading “The Hennepin County Sheriff's Office was not available for comment.” This was to dispute the obviously true report from the City Pages who yesterday, October 24, published the following pictures taken by Donna Brown s on October 23. According to Brown the shots were taken on "Lakota Territory near the Standing Rock Sioux Reservation." This move adds two armored vehicles and a SWAT team to the efforts of “local” law enforcement. According to a search of Department of Defense records, only one military vehicle has been purchased by any Sheriff's Department in North Dakota. At least three Iraq war surplus armored vehicles, each of a different type, have been photographed at the protests with the word “POLICE” as opposed to “United States Army” painted on them. They include this vehicle from which a masked policeman fired on a reporter's drone, which he was using to film police use of gas, dogs and rubber bullets on protestors. The drone, owned by Dean Dedman Jr, filmed the policeman illegal attack as seen below. Two others pilot using drone to film police actions, Myron Dewey and Aaron Turgeon, were charged with felonies including stalking and reckless endangerment. Firing on drones taking video is the least of the suppression of news of the over 220 arrests since the protest began including 127 this past weekend. 36 of the protestors have not had their bail set or been officially charged. The remaining 89 have been charged with riot. Riot charges have also been filed then dropped against national syndicated radio and internet journalist Amy Goodman and the 45 years in prison currently being sought for documentary filmmaker Deia Schlosberg on conspiracy charges because the Morton county Sheriff personally decided her content was unfair to huge multinational oil corporations after viewing her confiscated footage which is still be held as “evidence” of her “crimes.” Goodman's dropped charges are still under investigation as the State Attorney General's Office and State Bureau of Investigation hope to find a way of charging her with conspiracy as well. The North Dakota State Bureau of Criminal Investigation has been the largest recipient of military weapons under the Department of Defense 1033 Program out of all the North Dakota law enforcement agencies. Since 2012 they have purchased 58 M-16 fully automatic rifles along with the following accessories. These accessories include 37 M68 red dot reflex scopes and 79 QDSS-NT4 suppressors for silent killing. Along with the purchase of 7 M-14 .308 assault rifles for long range sniper kills and 80 individual military first aid kits this purchasing pattern points to the formation of a 90 man combat unit that could be directly used to enforce the will of the oil companies on Native People who have up until now merely been gassed for praying in the path of bulldozers. People have begun a mobilization in Minneapolis at City Hall to protest the use of local tax dollars to support North Dakota's enforcement of so-called private property rights on Native land ceded by treaty from the United States in 1851. The Mockingbird will continue to cover the protests at Standing Rock and around the country as they develop.